Thank you to Bueno for sponsoring today's post! All opinions are my own. It's finally starting to look AND feel like Spring here in Virginia - thank goodness! I have so much fun warm weather content to share with you and am so excited to share some new shoes with you today! I've had quite a few requests for high-quality sandals and Spring footwear on Instagram lately so today's post is a two for one. 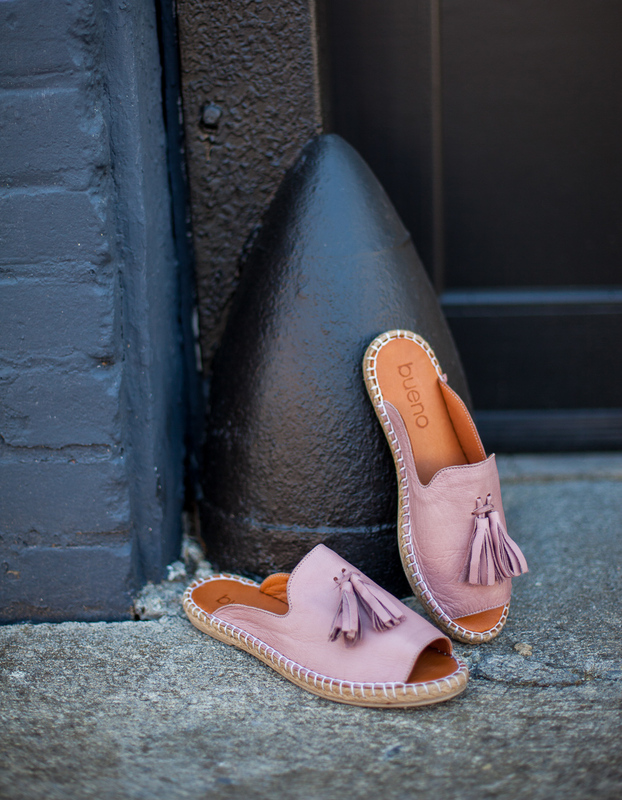 One outfit, two fabulous pairs of shoes from Bueno footwear. Bueno footwear is a new brand to Pardon Muah so I want to tell you a little bit more about why I love them so much. All of their shoes are handmade in Turkey and have been for over thirty years now. There's a fun video included in their About section on their website that actually shows the shoemakers handcrafting each pair! The leather they use is buttery smooth and they have supple linings (words they use to describe their shoes that are 100% accurate), making them extremely comfortable to wear. I was so pleasantly surprised when I tried on my first, and second pairs. As all of you know by now, I love pink! So it's no surprise that I gravitated quickly to the Laurel in dusty mauve and the Udo in rose metallic. I chose the Laurel first because I'm notoriously horrible for wearing heels all of the time, even when traveling. So I've been trying to find flat, comfortable, well-fitting shoes that are cute enough to entice me to wear them more often. I'm planning to travel more than ever this year so they are the perfect shoe for Spring & Summer trips. 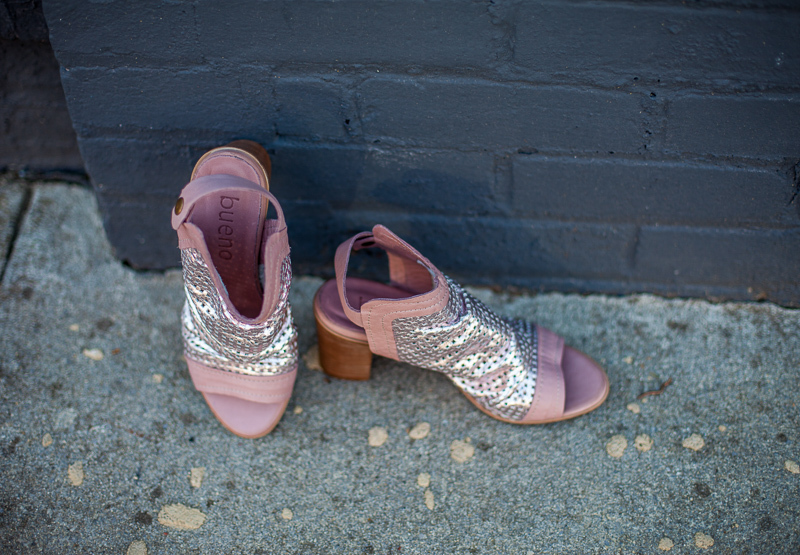 The Udo in rose metallic perfectly combines quality craftsmanship and a fun trendy style. I find that it can sometimes be hard to find both. And when faced with comfort and looks, I tend to go with looks (anyone else lean too heavily on the saying "beauty is pain"?!). Fortunately, in this case, you can have both! The heel height is 3 1/4 which is great for my petite gals who want a boost, but they really don't feel that high, which works well for anyone who primarily looks for cute & comfort. SIZING: Bueno shoes come in European sizes. I am a narrow size 7 and got a 37 in both pairs which fit perfectly! The leather used is so nice and supple that it does have some stretch. And guess what?! From now through tomorrow April 16, Bueno is having their Spring Sale where the entire site is 20% off with code Spring20! You can also use the code Amanda20 until the end of May! Thank you again to Bueno for sponsoring today's post!